According to the 2009 census, Kazakhstan has 39,172 ethnic Kazakhs who consider themselves Christians. 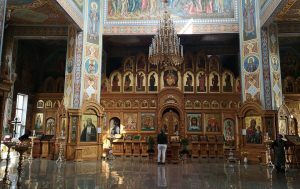 They are not only the members of various foreign Christian organisations, but also Orthodox Christians. — I have a Kazakh ethnic background. In 1999, when I was 20 years old, I was baptised and now I am the hieromonk of the Nunnery. There are Kazakh tribes that have Christian background, for example, Naimans and Kereits. If we look at the history of Kazakhstan or even the Tatar-Mongol Yoke, the territory of our country was the centre of Christian metropolis back then. Even Dal’s notes contain relevant stories. We have always had strong pagan traditions. Even Islam in Kazakhstan has some semi-pagan origins – when ribbons and papers are tied around trees. Even when we bury someone, we do it using pagan customs to some extent. It means our modern Kazakh belief is mostly Muslim, but in fact it is semi-pagan. Back in the Soviet period, we were all indifferent to religion, and after the breakup of the Soviet Union people began to read namaz, Quran, or Bible. Many people got involved into Christian protestant movements. I’ve also had such kind of experience, but when I saw how they behaved and what was happening there, how they used some techniques like hypnosis or NLP, I came to read more serious literature and started to go thoroughly into Christianity. At first, I read the Bible, then works of apostolic fathers, and only then I was baptised. It was my own desire, no one has ever forced me in my family. My mother is a philologist, which may have had some influence on me. There was always a lot of Russian literature at home, and Russian philology and literature are strongly based on Christianity. I’ve always wanted to be a teacher. I studied at the Kazakh National Technical University (Polytech). But soon after I was baptised, my interest changed from engineering to spiritual and I went to the seminary. At first, I just found out more about it and in a year, in 2001, I entered the Moscow seminary. It is located not directly in Moscow, but in Sergiev Posad, previously known as Zelenogorsk. Then I was assigned back to Almaty. I could stay there and I was offered to stay at the Lavra of St. Sergius, but it’s always better to be within your circle. When I was studying at the seminary, my ethnic background was not important at all, we were all different: Yakuts, Koreans, Russians, Chinese. The Moscow Theological Seminary is the most ancient and largest theological educational institution, an Orthodox Oxford, or, even vice versa, our seminary is older. As to relations here [in Almaty], here in our church we have many parishioners of non-traditional, unusual ethnicities. For example, if you look at the surnames of the parishioners of our church, you’ll see 78 per cent of Turkic surnames. For example, my godfather’s name is Vladimir Utegenov. He was a hieromonk back then, and now he is a hegumen. In our parish, in Sophia temple, we have a lot of Koreans, Kazakhs, Tatars. However, many parishioners keep their religion secret. My family knows I am a priest, yet I try not to expatiate upon this. However, after our family was brought to church, my mother and grandmother started to pray. But my grandmother prays in a Muslim way, fasts more often, just like some of my sisters. I usually wear secular clothes for occasional services (services at the request or at the suit of believers – editor’s note). For example, I come to some district with this backpack, and then I change to clerical clothing, do all the rites and then change clothes back. Some of our parishioners take their baptismal cross off to avoid any conflict. Sometimes, they take their grandchildren to a Muslim grandfather and ask them not to tell about the church. Although, it rarely happens in Almaty because it’s a big city where one can easily get lost. The situation is different in remote areas. People are always cautious. It’s not only about the attitude of Muslim Kazakhs to Christian Kazakhs, but also about the cautious attitude of Russian Christians. In fact, I see that Kazakhs tend to be more religious. Now at least one Kazakh woman brings a child for christening once a month, which is more than it used to be before. Just recently, we met an oralman from the region. He was in spiritual search because he couldn’t find what he sought in Islam, so he came to us. I have a catechesis (brief description of the religion in the question-and-answer format – editor’s note) in my library in Kazakh language. I read it, but it contains errors. Back in 2010, our church said we would officiate in the Kazakh language, but we don’t for the time being. However, we have some priests who speak Kazakh with the parishioners. Our main parishioners are Russians, of course. Father Yelisey, who translates the website into Kazakh, teaches Kazakh language every Sunday in the Christ the Saviour Cathedral free of charge. — There are six members in our family: father, mother, I, little sister and two little brothers. The first who adopted Christianity was my mother, it happened in 1987. For the first two or three years, her relatives were against it, but then they quitted. My mother’s family members are from Astrakhan, so they were brought up more in Russian traditions, so it may have had its impact. My father received Christ two years later. We were brought up and raised in this religion since childhood. We didn’t see any peculiar attitude to us when we were kids. However, in middle school we came to understand that we were Kazakhs, and non-Muslim Kazakhs were seen differently. I was asked, “Why are you different?”. However, I didn’t care much about it. When I became older, it became more obvious. I came to understand the link between religion and ethnicity and I began to seek understanding. However, I found out that the truth is what I accept and believe in. The hardest time was at the university. It was very traditional and with Kazakh language of instruction. The students were athletes from rural areas, and when students got to know I was not a Muslim, they stopped talking to me. Some people kept out of my way. I’ve never noticed any discrimination in Almaty, but when we visited our relatives in a village, I saw discrimination. No one told us directly, but we heard different rumours and criticism. People said we betrayed our religion, people. In short, they said we were betrayers. When people approach me and ask directly, I always say I am a Christian, not a Muslim. My parents did the same; they never made a secret out of it. They both served the church. My father got retired, and my mother is still serving, she’s a pastor in the church. Overall, Christians in big cities of Kazakhstan feel better. My family has moved to Kazakhstan now. Our rights are violated in small towns. It has different forms now, but compared to the 90s it’s different. People have become more open, more educated; many have been abroad and take representatives of other religions differently. However, it was very tough in the 90s.